Today I was looking through some old files and I found the writing below. I wrote it a year ago (2016), after returning from the same White Mountains (AZ) where I just visited. All written is still true, even more true in this unsettling world. It is meaningful to receive this reminder. I share, so you know me a bit more, and to share The Body Keeps the Score with you. There are two main things that I learned this month. In one sentence I will refer to them as “The Nature of Trauma”. I had a dream, right after being called to shamanize 20 years ago, that I and a group of circus-looking people were traveling around (in vehicles not flying), “sharing with people what we had learned”. For 10 Summers, 2000 to 2010, Jacob and I traveled in a van around the public lands of the western states. What I saw in all these places, what has happened to the land, the Trauma it has endured, inspired me to share these places with others. Even though it was the very beginning of the tech curve, I found affordable technology to make many videos, as well as record many audio files. I would say that I “traveled around, sharing stories that want to be told”. One time I drove 50 miles for an ethernet cord so that I could upload a video to the new “high speed” internet. This past month we were able to go to the White Mountains in Arizona for 3 weeks. Even after 6 years, and me being way closer to 50 now then 40, I have seen that the living out of my van in nature life is still good for me. I thought I might not like it anymore, but I was wrong. Now, with so much better technology and connection, I can more effectively share my experiences with tree water, wolf, vulture, jaguar, parrot, the beings that are being traumatized as we speak, with anyone anywhere with a connection. Will it affect change by doing so? Maybe, maybe not. But it makes me feel better, and since returning to Tucson I have been greeted by many who know me with some comment about how they have loved my posts in Facebook. So some effect has been made. 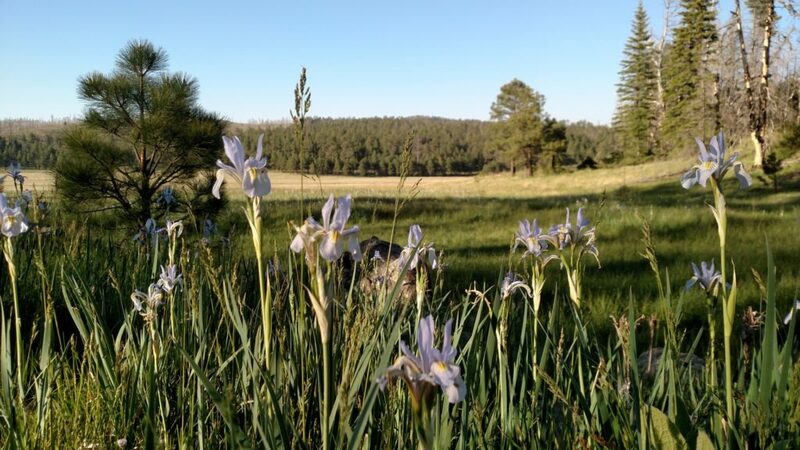 We broadcast live our Pinecone Summer Solstice and full moon Labyrinth walk from the national forest outside of Springerville, and it was a personal triumph. So many times in the past I was frustrated about the level of tech available to me and years past I thought I would have to have expensive equipment and connection to share my experience with others. This month I did it all from my phone. Why is this important? Because so much cutting, killing, over grazing, and disrespecting goes on in the nature places out of sight of most of us, so to witness and share the beauty, and devastation, has, and apparently still is, a huge part of my work as a Shamanic Practitioner and Animist Minister. Our body is the Earth, Our Earth is our Body. We are One. The second issue that became very prominent in the last month is TRAUMA. Individual and cultural trauma. While in the mountains I actually had time to read a book. The book that I read has been turning my brain. It is a book that was revealed to me this last winter through a Soul Ambassador training in Florida offered by Opus Peace. Basically, the training was about trauma, how it affects us, and what helps to heal the patterns and wounds of it. This book became a manual for the ones who created the training. These retired veterans hospice nurses call trauma Soul injury. I have been realizing since that training the extent to which my soul work of my own, and working with others, centers on Trauma. The book is called The Body Keeps the Score by a doctor named Bessel van der Kolk. The book is thick with so much information that my rambling brain is trying to take it all in. He shares his extensive research that scientifically shows how trauma affects us, our minds, our souls, and our bodies, especially when these things happen to us when we are children. All of us may think that this is obvious, but his book takes it so deeply, that it makes me realize the extent that we all are affected by not being wanted, not being safe, and not being believed. Simply stated, his 30 years of experience has brought this simple, and dare I say obvious, truth to light. When we, especially when we are small children, do not feel safe, listened to, or believed, our bodies and brains are affected. When we experience acts of violence, and especially if we are disbelieved that violence has occurred, we learn to not trust ourselves or anyone else, and this fundamentally alters us as human beings, making us feel that the “world” is a mean and unsafe place. Traumatized human beings create traumatized patterns within families, traumatized human beings create traumatized cultures. This all seems very obvious I know, but it is so deeply profound, this cultural secret of trauma over many generations is so embedded in our cells, that after a while, in our minds, we may even “forget” it is there, but as this doctor says the body always keeps the score. Our bodies, and the body of Earth. This… The Nature of Trauma, is revealing itself to be the foundation of my spirit work in a traumatized world. Hi Quynn, I too have read this book and author. I appreciate your piece, I learned in the realm of counseling traumatized refers to the after state from trauma and in terms of historical trauma the state can remain for generations. This is true for our prtsonal and famoly experiences of trauma and traumatization. The good work can shift the state from traumatized to someone who has experienced trauma and healed the soul wound, damage to hippocampus and the damage the cortisol overload release it does with trauma based stress overload, their core beliefs, on and on. How do we shift the State is the question and at what expense?